Recently when the on-going Food event LYRO was announced at SindhiRasoi, I received a sweet Email from Poonam , a really enthusiastic lady, who shared some cool tips and tricks of cooking and some suggestions for this website. One of her suggestion was to rename the Event LYRO (Link your recipes of …..) to LINK~Your Recipes of…..! I actually liked the suggestion, because LINK sounds much better than LYRO, so henceforth this event will be known as LINK. Thanks Dear Poonam for your wonderful Suggestion ! Coming to the LINK~Your Recipes of Potato, which was the first theme of LINK event, I am Thankful to those sweet bloggers who took out time to submit their recipes of Potato. I am really sorry if you are yet to hear from me a Note of thanks for your efforts, but be sure I am obliged ! Taro Root or Kachalu or Arbi, or Arvi, is one favorite Tuber of mine. I love the nutty and fishy flavor of it. Though Peeling this sticky tuber is something I dread as it leaves my hands itchy, but that doesn’t stop me to add this tuber in my meals . Let’s check it’s Health quotient…. Like many vegetables, taro root is great for those who are trying to watch their fat intake. One serving of taro root (132 g) has only .1 g of fat per serving. This fails to even register as a single percentage of your daily amount of fat. Taro is high in beneficial nutrients, such as dietary fiber. One serving has 7 g of dietary fiber. This is 27 percent of your daily recommended amount of dietary fiber. Dietary fiber is important for two main reasons. Dietary fiber is great for the digestive system, as it helps to speed up the process and make the system regular. It can also help to lower cholesterol. One serving of Taro has 0 mg of cholesterol. This same serving only has 20 mg of sodium. This is only 1 percent of your daily value of sodium. Taro is high in a few vitamins that are important for the body. One serving has 11 percent of your daily value of Vitamin C. One cup of taro also has 19 percent of your daily amount of Vitamin E and 22 percent of your daily amount of Vitamin B6. Vitamin B6 is important for the immune system as well, whereas Vitamin E can help to reduce your risk of a heart attack (according to NutritionData). One serving has 10 percent of your daily value of magnesium and phosphorus, while also offering 13 percent of your daily value of copper. Taro is an excellent source of potassium and manganese, with 18 percent of your daily value of potassium and 30 percent of your daily value of manganese. Potassium is important for the regulation of your heart functions and your blood pressure, while allowing your muscles to work as they should. Manganese is important for the “metabolism of proteins and fat” while helping out the immune system . Still any doubts? Read this ! Stuffed Taro root, a spicy, stuffed arbi recipe ! Wash Kachalu and boil them in salted water till half cooked.You can pressure cook these for one whistle. Cool, peel them, and fry for sometime till slightly golden in colour. Let them cool and meanwhile pound Coriander leaves, green chillies, ginger and garlic in mortar pestle (Hamam dasta) till a coarse mixture is obtained. Add some salt, turmeric powder and coriander powder and mix properly. Now slit each piece of kachalu, holding it with the tapering end upwards and the broader end downwards, moving the knife gently in the center, from the top to bottom and slit till ¾th of length.Repeat procedure for each piece and stuff each one with coriander mixture. Take a nonstick pan and pour little oil and cook the stuffed kachalu on slow flame, with a lid on. Keep tossing at regular intervals to avoid burning or charring of these and cook these till the rawness of green mixture is gone,approximately for 5-8 minutes. 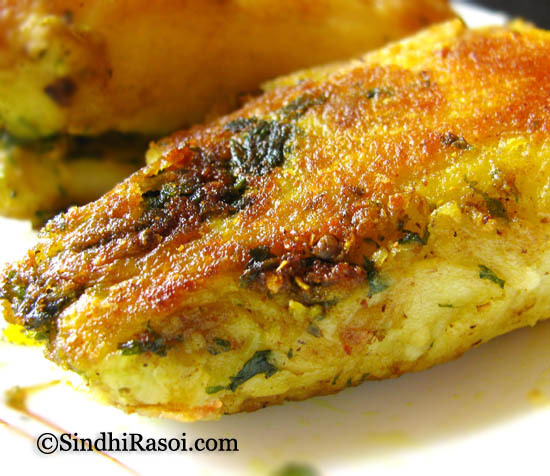 Serve with Dal rice or any Pulav/Biryani and enjoy the awesome Fish like taste of stuffed Arbi. 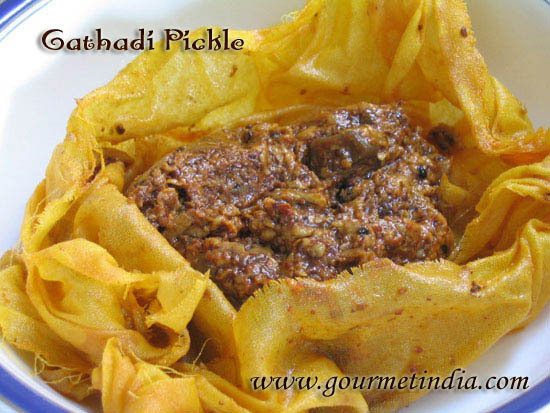 Today many Sindhi women might be busy cooking for Thadri, the festival of Sindhis in honour of Mata Sitladevi, wherein food is cooked a day prior to Thadri and the same is served on the Thadri, since it is the day of eating Cold Food. Generally Food like Lolo (both cooked and fried ), Koki, Besani, Dal waro Phulko, Dhai Wada, Dhaas Karela, Dhaas Bhindi, Mirchi Pakora, Methi subzi, Sayi chutney etc. is prepared to be consumed cold, on Thadri. What’s cooking at your place today ? Happy Thadri to All of You ! Tarla Dalal has ” Badam aur Arbi ke kebab” in her restricted section. The ingredients list are open access. 1. arbi are peeled most conveniently when steamed or boiled with skin on, until just tender or under-done, then drained & steamed on dry heat for a little bit until the right consistency: firm for mashing, not gooey. Then skinned while fairly hot. 2. NOT mashed to glue but left with pleasing lumpy texture and roughness. 3. onions thin sliced, placed in COLD oil or oil-ghee mixture, covered, brought to slow simmer, cooked slowly, then cover off, to make bereshta or browned onions. These are taken out very light gold, when they darken & are made chura, crushed coarsely by rubbing in the palms after they cool down on a towel etc. 4. in remaining oil, gently toast cashew+ almond + a few cloves garlic palest gold & grind with masalas, [toast lightly if wished] i.e. white cumin, black peppercorns, few cloves, white poppyseed, kuti hui [pounded] red chilies], trace black cardamom, a little green cardamom, cassia bark, pinches good mace & nutmeg. Mix in the browned onion chura. fresh chopped ginger & green coriander leaf & green chili, if desired. Some add roasted chickpea flour, NOT roasted BESAN, for its unique taste & binding properties. You may add more chopped nuts & fried raisins, even small fresh coconut cubes very lightly fried, for richness. Personal preferences rule. 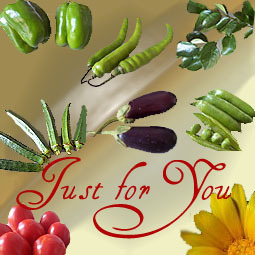 Some like sweet, some hot, some sour, some heavy spice or masala flavors,others vegetal. or, arbi mix can be threaded on skewers like seekh kebabs & brushed with EITHER a saffron-butter OR butter mixed with dry kasuri methi while grilled over coals. OR, you can shallow fry the kofte and make a pan gravy, karahi style, and serve them with nan & sheermal. I like coming to your blog and see the wonderful sindhi cooking , loved this arbi fry n it’s going to be tried soon. @ Alka :Thanks for the comments in my blog. Yes, I posted in my Aloo tikki recipe about my marriage with a Sindhi guy. I was very new to Sindhi cuisine and no one knew to teach me also. (12yrs back, no internet and blogs to follow 🙂 ) I learnt Sindhi cooking by my MIL and a book by Anita Raheja which my brother gifted me. And after the blogging started, I have followed many of recipes too. I have already posted few recipes in my blog, and will try to do in future also. You have to correct me if I am wrong!! nice theme …. will surely send some entries ………..
what a delight (arabi/katchalu) after such a long time had tasted when teenager,Alka keep up, great recipe will be trying out in the weekend. I wanted to know the last date of this linking please. This is a great event. I had lots of potato recipes but didn’t link any as I wanted to have POTATO as star ingredient recipe. I have never cooked with taro root, so, this will inspire me to prepare recipes with this. sounds like a great event..love this idea of LINK..very interesting. I like this root veggie alot and prepare once in a while or whenever I get some eddo in asian stores..Your recipe sounds new to me.never had stuffed eddo before…thanks for the recipe..